The hunting dogs, many of which are strays, lead a very poor life and very little care is taken of them. They are kept chained up day and night and only released for hunting. Most of the shooters only go out at the weekend. So long as it moves, then it is shot. Very often at the end of the season or when the dogs are ill or are finished with, they are dumped and left to fend for themselves or die. It has been known that, rather than 'waste a cartridge', the hunters have hanged their dogs. 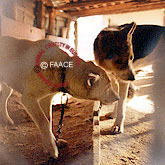 FAACE recently investigated one of the many places where 'hunting' dogs are kept. 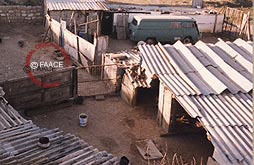 It was just a collection of ramshackle sheds, a long way from the nearest road and habitation. The dogs were chained in rows to the floor. 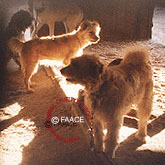 The nearest dog refuge showed FAACE a number of 'hunting dogs' that they had rescued, one had lost both his eyes. We were told that one of the hunters had shot them out, for fun. There are anti-cruelty laws in place in most regions of Spain that could, if the will was there, be used to stop this cruelty. We have to change the mindset that considers this behaviour as normal. One way to bring change about is to expose the cruelty and shame the participants.